Used to be: Opera Singer. Waitress. Script Reader. Now: Expert On All Things – But Only The Things You Wish You Weren’t (aka: Being a Parent) + an author. I don’t think you can have it all—at the same time. You can’t be at the office and raising your children at home at the same time. One is not better than the other. But it’s hurtful for one side to claim you can have it all simultaneously. Even “leaning in slowly” or whatever the Sheryl Sandbergs of the world claim you can do is not true. These career women rely on nannies or family members or fathers to raise their children. Not that there is anything wrong with that. But I find it belittling to those of us who stay home without nannies or full-time or sometimes even part-time help to claim that one can work and raise kids equally well. A woman without help who raises her kids knows you cannot do both. We live in a world of choice and that is the greatest gift the feminist movement gave us. But don’t pit us against each other by telling these lies to relieve the other side’s guilt. It’s really hard to be a stay-at-home mom. It’s really hard to be a career mom. It’s really hard to be both of those as dads, too. So really, it’s just hard to be a parent. And that’s where we should all meet. I wish I could take my own advice: see above. Taking a walk on our beach in Maine. Who my kids were going to turn out to be. Wouldn’t it change everything to see your kids—just a glimpse of them at age 20 or so—when you yourself were 20? That would be so cool! That would change everything! Maybe you see them driving a car that cuts you off and “God” tells you that’s your own kid in the future so you have to refrain from honking and cursing at him or her… That’s a book idea right here. What happens when you die? Is that too much to ask? Cooking. Particularly animals. I don’t eat anything that had parents. But I have to cook them for my family. A flight attendant’s. I often try to decide if I’d rather be a flight attendant or the people who work at Hair Fairies who pick lice out of kid’s hair all day. I’m undecided. I read a lot of nonfiction and memoirs because I am super paranoid about lifting someone else’s storylines. So I stick with facts. Stress Test by Tim Geithner. I love the stock market. I come from a family of investment counselors, but only on the male side. They are fairly chauvinistic, so I’ve had to figure out much of the stock market on my own. At 13, I invested my babysitting money in Ben & Jerry’s. And that was just the beginning. Activity? Shopping. Love it. Can’t help it. My girls are all on Varsity Shop with me. There’s only four of us on the team. My husband keeps trying to ban us. Thank goodness for Title IX. Food? I’m very tight with rice cakes. Give me a rice cake, I’ll give you a meal. Website? Flipboard. Not really a website, but an on-line newspaper. That flips. You can make your own magazine. Mine has Tech and Celebrity Style. That pretty much sums me up. Seven. If I’m lucky. I get up at 5 am to swim on my Masters Swim team before I rush home to get the girls up for school. So I need to be asleep by 10pm. But anyone with teenagers knows that’s very, very hard to do, especially with teen girls who raid closets late at night. I think I: am extremely vain. I wish I: listened better. My kids: are so much more talented than me. It’s awesome to see. Yes. I want to add how grateful I am to be able to be a stay-at-home mom. My husband is the one to thank for that. And thank you, Susie, for having me on your fantastic site! 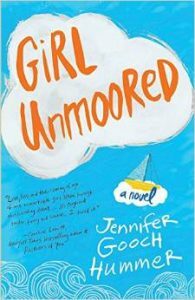 Jennifer Gooch Hummer is the award-winning author and screenwriter of her debut novel, Girl Unmoored (SparkPress). Girl Unmoored has been optioned for film and was also published in German (Carlsen). She has worked as a script analyst for talent agencies and film studios. Jennifer has also been a mentor with WriteGirl, an organization for under-privileged young adult girls in Southern California. She lives in Los Angeles and Maine with her husband and their three daughters.